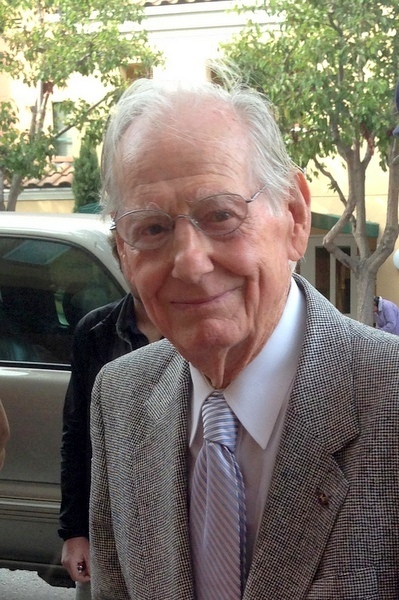 Veteran artist Wayne Thiebaud -- who will turn 93 on November 15th -- isn't slowing down a bit. His current one-man show at the Paul Thiebaud Gallery, Memory Mountains, consists of 31 paintings and 17 works on paper and fills both floors of the gallery. The exhibition is, among other things, a tribute to Thiebaud's dedication to his craft: several of the canvases on view have been heavily worked and re-worked for periods of up to ten years and some of the works date back to the 1960s. 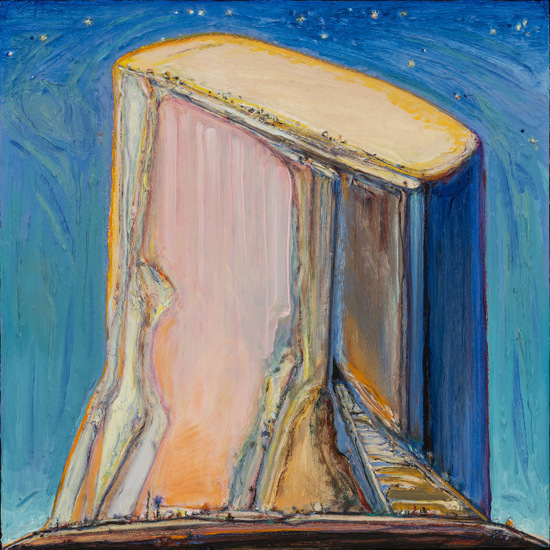 In a 2010 New York Times interview Thiebaud acknowledged that he often paints outdoors -- to "fortify his focus" -- while admitting that plein air painting did not allow him the flexibility that his imaginative approach to subject matter requires. "But with me," he noted, "it's about remembrance -- sketching certain types of reflected patterns, different kinds of lighting, then conjuring it up with your memory and imagination." The Memory Mountains are a varied lot: towering ridges, city-topped buttes, and sandstone mesas, and all of them glow with the artist's characteristic palette of rich complimentary colors. Even though each emanates from some kind of memory, the mountains have been stylized into hybrid forms that fuse the ridiculous with the sublime. 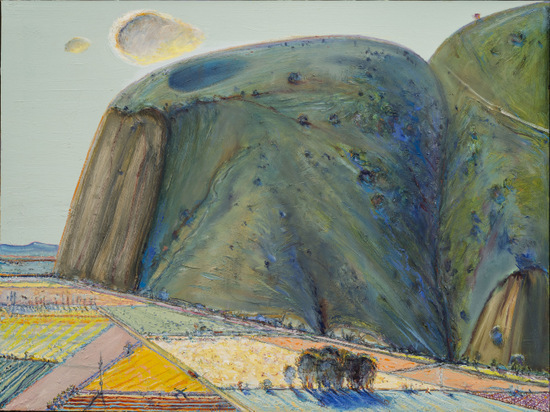 When I recently spoke with him by telephone, Thiebaud told me that he thinks of memory as "one of nature's pleasures" and the pleasure he took in conjuring up the various crags, boulders and cliffs in this exhibition is clearly evident in every image. 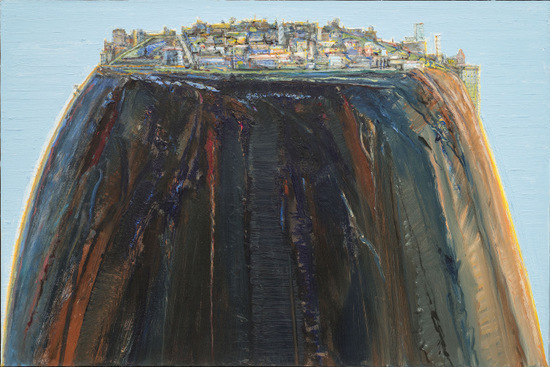 During my phone conversation with Mr. Thiebaud we spoke about his mountains, his artistic intentions and his work ethic. What can you tell me about the ideas behind your Memory Mountains? The Memory Mountains offered me the opportunity to mix abstraction and representation: that is the origin of my main idea. The other idea was that the mountains came from some actual experience or place some time back in my life: from Arizona where I was born, from my time growing up in Utah and Southern California or from my later life in Northern California. Those places are the main sources of the memory material I worked with. Laguna Rise, 2003-2012, oil on canvas, 24 x 35 7/8 in. Were any of them painted outdoors, or do you conjure them entirely from memory? That is exactly what I do. I have worked a lot from direct experience, but these were designed to try and do something else. Essentially there were sort of three characteristics or aspects that I wanted to focus on: maybe I can explain them to you without boring you. One was the idea of humor: how I can find a seriousness in mountains -- which can be as sublime an idea as anything -- but then go all the way to a kind of silliness or ridiculousness. I find it ridiculous how we name them: oh, things like "The Devil's Woodpile." Or we decide that we're going to carve 40 and 50-foot high pictures of our presidents into them. And the other things that we do to the poor mountains: how we sort of cut our way through them or arbitrarily cut their tops off. Or how we mine them, cut all the trees off them; all these kinds of semi-ridiculous things. There was the sort of opposite aspect of venerating them and having them be spiritual sources. That extreme -- from the sublime to the silly -- was something that interested me. Another idea was the idea of position of mountains. We mostly see them -- and almost have to see them -- from afar, unless we are walking in them or hiking in them or driving in them. There is this tendency to see mountains pretty much in the distance and I just wondered what would happen if you tried to get them as close as possible. It seems that they are almost coming to overwhelm you: or that they seem somewhat ominous in their character. 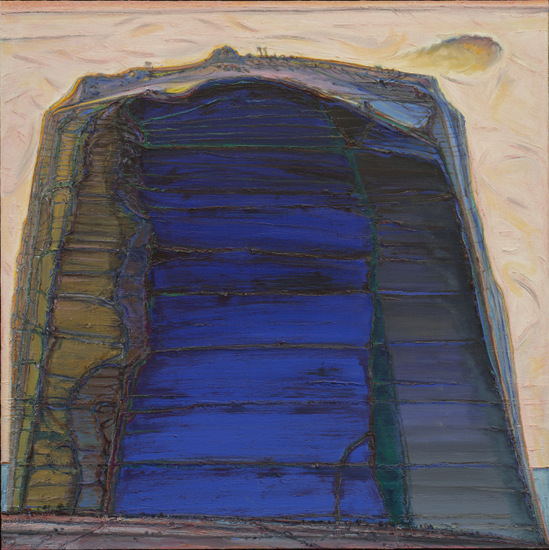 Big Rock Mountain, 2004-12, oil on canvas, 54 x 54 in. It is the loss of horizon which I think gives them a peculiar position. That interested me essentially because it was a sort of oppositional research that was helpful in establishing a more abstract potential. The third aspect was that I had to have a kind of naïve omnipotence about making my own mountains. Not just painting mountains, but to really actually believe that I was forming the rocks, the sediments that the wind had blown, or other aspects of it. I was interested in that sense of a bas relief in addition to the painting. Those are some of the things that I tried my best to see if I could get some results from. 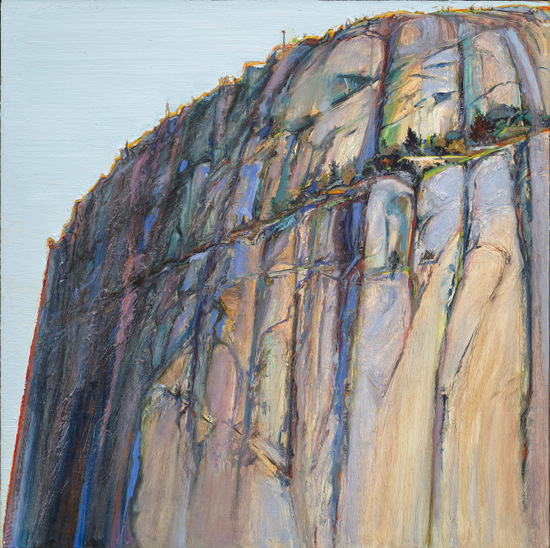 Yosemite Rock Ridge, 1975-1987, 2011-2013, oil on canvas, 36 x 36 in. I feel very privileged to be however tiny a part of that great tradition of being a painter. It's been very special to me in addition to being very interested in teaching. Green Hill Farms, 2008-2011, oil on canvas, 36 x 48 in. What is your daily painting schedule like? You seem to have tremendous self-discipline. You know, I didn't go to art school John. I came up through the ranks of cartooning and illustration and graphic design: I have a lot of respect for the artists in those fields. I had that kind of apprenticeship where you are supposed to just work and you are obliged to not ignoble those traditions: the great traditions of the design and typography and decorative arts, the ideas of design and drawing. 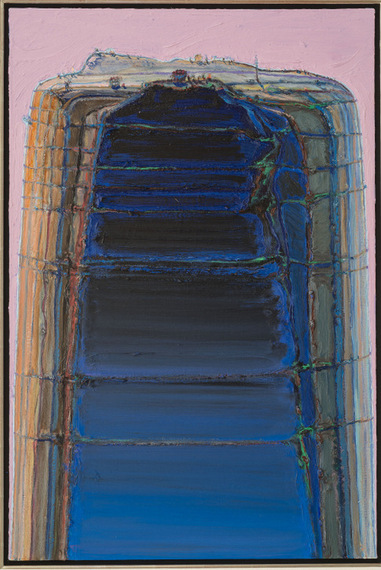 Mountain Layers, 2010-11, oil on canvas, 36 x 24 in. It must sometimes feel surprising to find yourself defined as a fine artist, having come from that kind of commercial art and design background. And while it has been diminished somewhat that tradition is going to have to maintain itself and to re-invent itself continuously. There are very basic things that are not to be ignored, in my opinion. 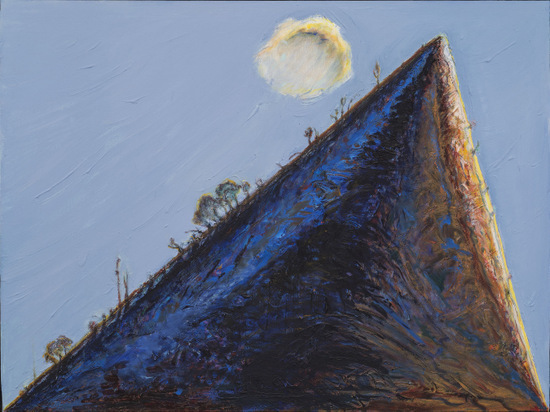 Night Mesa, 2011-2013, oil on board, 24 x 24 in. They (students) have a rather naïve idea about creativity and self-expression. Even though they don't have a "self" yet they have these difficulties in coming to grips with the idea that they are going to have to work harder than they have even imagined in order to really distinguish themselves or to be sure not to insult the great tradition of something like painting. Peak, 2013, oil on canvas, 35 7/8 x 48 in. Have you read Nancy Boas' book: David Park: A Painter's Life? She tells a wonderful story about how as a young man Park attended a 1930 luncheon for the artist Henri Matisse. Matisse told the young artists attending the event: "Talk less. Work more." There is certainly is a lot of talk today. Yes I have read it, and she interviewed me: we own some works by David. He was a great influence on people here -- particularly Diebenkorn -- who in turn influenced me. I'm obviously a very influenced painter and I delight in being so. 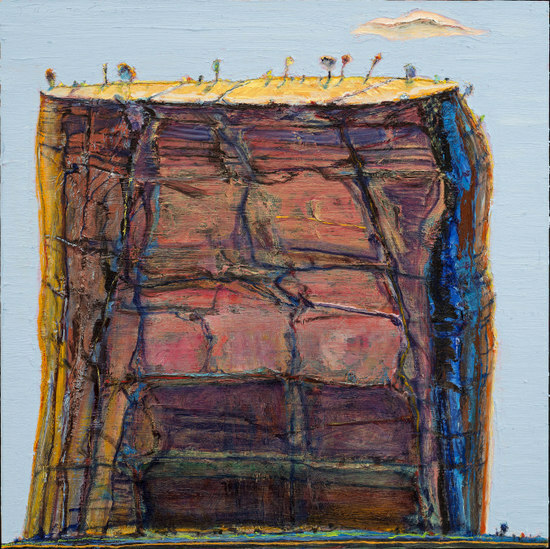 Rock Mesa, 2010, oil on board, 24 x 24 in. 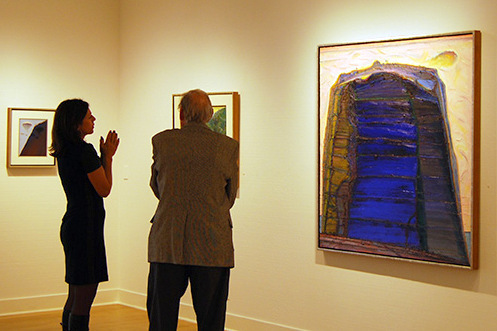 When someone walks into your show, what do you hope they will grasp or enjoy about the paintings? Well I hope first of all that they will smile quite a bit at the ridiculousness of some of the images and get some sort of pleasure out of it. That would be rewarding to me. Also I hope particularly that young painters and other artists would not feel that I have insulted the tradition.